Kraft paper’s breathing structure allows seed, etc materials inside to be protected in a hygienic manner, without occurrence of any moisture and sprout. 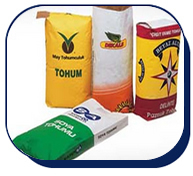 It is the most preferred packaging method that can best express the seed inside with multi color printing facility. It is easy to stack, store and ship. and for similar products, 10 kg, 20 kg, 25 kg valve hexagonal bottom and open mouth (open mouth sewn gusseted, open mouth sewn) sacks are recommended.